CHARLOTTE — The contrast could not have been more stark. Four years ago, Sen. Barack Obama used soaring rhetoric to project his first term in office would lead to a time we would tell future generations that the rise of the oceans receded and the planet began to heal. Last night, in Time Warner Cable Arena, a sober, matter-of-fact President Obama said change was hard, and takes root slowly. 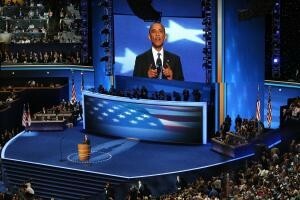 He accepted the nomination of the Democratic National Convention by warning Americans that the sweeping alternatives offered by the Republican ticket of Mitt Romney and Paul Ryan were risky and with the nation heading in the right direction, the only safe choice Americans could make would be to give him a second term. “Hope and change” was whittled down to “hope” — and perhaps pray that the president would get it right the second time around. As a number of pundits pointed out, the speech seemed more like a State of the Union Address — a laundry list of somewhat specific goals and accomplishments — rather than an appeal for re-election with a soaring agenda and rousing calls for action. Perhaps that was what Obama felt he had to do. Polls indicate a close race, with few undecided voters. A speech offering no major promises and asking Americans to stick with the devil they know might work if Romney and Ryan could not sway those undecideds over the next two months, or if the economy showed new signs of life. It was if the president were channeling Dana Carvey’s impression of the first President Bush: Stay the course. Don’t rock the boat. Wouldn’t be prudent. Vice President Joe Biden served up more energy than the president, and, to use a favorite Biden term, “literally” may have outshone Obama. Even so, both incumbents’ speeches rambled, lacking a central theme, aside from the main argument of the Charlotte convention: America’s hopes depend on a strong(er) central government and any attempt to restrain or reform it would unleash hordes of greedy businessmen who would leave the poor and the sick to choke on toxic air and poisoned water and die of starvation and neglect. Or at least that’s how it sounded to me. Biden spent the most time of any convention speaker defending the president’s competence and character but, like the president, he gave little indication of what programs a second Obama-Biden administration would pursue that differed from the agenda they pursued in the first term. With the nation experiencing more than 40 consecutive months of 8 percent unemployment, and the national debt zooming past $16 trillion, “stay the course” does not sound inspiring or reassuring. Biden also unintentionally may have given Republicans a sound bite worthy of a campaign commercial. Setting aside Biden’s seeming ignorance about the constitutional role of the executive in the United States, if creating jobs is the president’s job, then he may deserve a pink slip. CNN noted Wednesday that since Obama became president, only 300,000 net jobs have been created in America. The story also cited a study from the left-leaning National Employment Law Project concluding that the vast majority of new jobs are in low-skilled, low-paying fields. Bubba may have prevailed. In less than two months, we’ll learn whether it mattered. Rick Henderson (@deregulator) is managing editor of Carolina Journal.